Kevin Aguilar (blue), will face Enrique "El Fuerte" Barzola in a featherweight bout UFC Fight night in Philly. UPDATE [8:20 p.m.] — After announcing the ninth bout on the UFC Fight Night Philly card, we've learned of another addition to the card: a bantamweight matchup between Liu Pingyuan and Ray "The Tazmexican Devil" Borg. Liu, a 26 year old from China is 2-0 in UFC (13-5 overall) and hasn't lost since 2013, winning nine straight. He'll face off against Borg, who is 11-3 but hasn't fought since October of 2017, when he lost to Demetrious Johnson. Borg, who fights out of Albuquerque, was scheduled to fight again in the spring of 2018, but his bout had to be pushed back due to an eye injury he suffered when someone from Conor McGregor's team broke the window of a bus. The fight was rescheduled, but Borg, 25, had to withdraw for personal reasons as his son recovered from brain surgery. Borg's most-recent bout, which was scheduled to take place last November, was cancelled three days prior to the fight due to medical reasons. Earlier this month, PhillyVoice broke the news that a middleweight bout between David Branch and Jack Hermansson had been added to the March 30 Fight Night card at the Wells Fargo Center, marking the eighth bout to be added to what promises to be an entertaining event, featuring a main event matchup between Edson Barboza and Justin Gaethje. Now, with just over a month to go before UFC makes its return to the City of Brotherly Love for the first time since 2011, we can add fight No. 9 to the card. UFC has confirmed that Enrique "El Fuerte" Barzola will face Kevin Aguilar in a featherweight bout. Barzola (15-3-1), a 29-year-old Peruvian fighter, is 5-1 since making his UFC debut back in 2015, including four straight wins. In fact, his only loss in the promotion was a split decision loss to Chris Avila back in November of 2016. 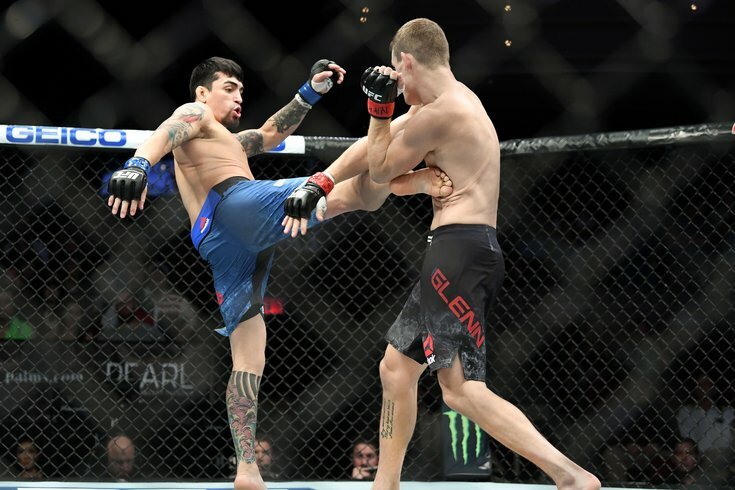 Aguilar, also known as "The Angel of Death," is a 30-year-old from Longview, Texas, and has put together quite an impressive resume despite the fact that he only has two fights under the UFC umbrella. With a 16-1 career record, Aguilar has not lost a fight since 2013, and most of his wins have come under the banner of the Legacy Fighting Championship (now known as the Legacy Fighting Alliance following a merger), where he was the featherweight champ. But after a Contender Series win last summer, followed by a unanimous decision win over Rick Glenn in the finale of The Ultimate Fighter 28 last fall, Aguilar vacated his LFC title to join the UFC. No word yet on whether someone with local ties — perhaps CFFC lightweight champ and Philly native Sean Brady, or current UFC fighter Kevin Holland, who has family still living in Philly — will get the call to fight in Philly later next month, but in the meantime, here's a look at all nine* of the fights we know so far (there will be 12 in all).